18 December 2011 - David sprayed grazon 22L from Burke Road bridge around east side of billabong, including part of Chris Cross embankment, and then half way along the sthn bank of the billabong. Slashed more of the woodland. 2 + 2 hours work. In their comments re the pH, they state "The pH is quite low which could be related to eucalypt leaf falls creating organic acids." 7 November 2011 - Slashed about 1/3 of the woodland area - 4.5 hours work. 27 October 2011 - RMIT students finished their work beside the river (2012 area) and planted another 300 plants, approx 3hours work x 20 Slashed beside half the length of path. 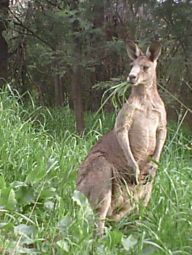 Trail cam photos showed a kangaroo over a period of 12 days - 2 hours work. 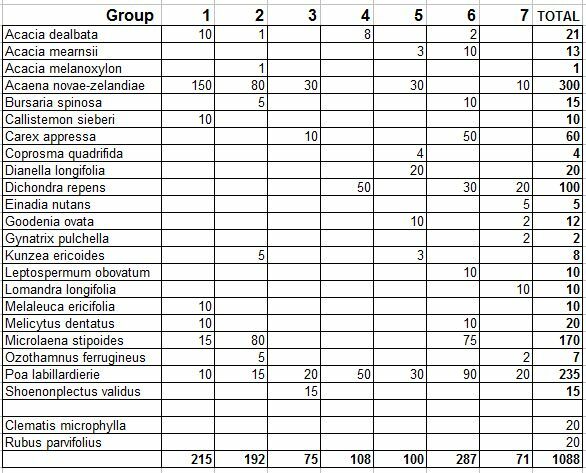 6 October 2011 - RMIT students continued their work beside the river (2012 area) and planted 750 plants ('view image' to see full size list). approx 3hours work x 20 Slashed more of the woodland - 2.5 hours. 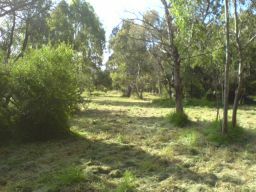 5 October 2011 - Mowed the picnic areas and beside the path. 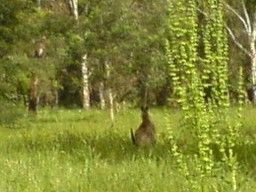 Put memory card into trail cam and disturbed an eastern grey kangaroo. approx 1.5 hours work. 2 October 2011 - Slashed more of the 2011 area on the south bank of the billabong. approx 3 hours work. 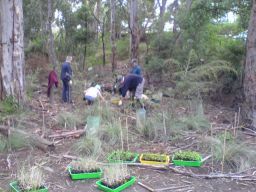 22 September 2011 - RMIT students rolled and removed more Trad from the area north of the path near the bridge. More frogs were found in the Trad and two snakes seen. 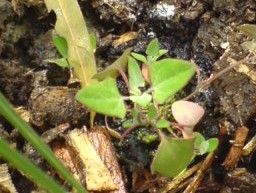 Some students started planting poas (Poa lab..), bidgee-widgee (Acaena novae-zelandiae) and kidney weed (Dichondra repens). approx 20 x 3 hours work. 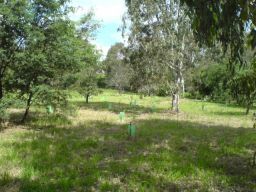 19 September 2011 - Slashed the 2011 area on the south bank of the billabong, cut and painted a small copse of hawthorn. approx 4 hours work. 16 September 2011 - slashed and sprayed under and beside the bridge where students had difficulty rolling the Trad due to kikuyu through it. Slashed the 2009 area spraying some of the Trad. approx 4 hours work. 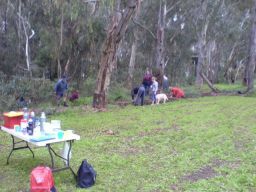 15 September 2011 - RMIT students rolled and removed more Trad from the area north of the path near the bridge. More frogs were found in the Trad. approx 20 x 3 hours work. 9 September 2011 - Community work day deferred due to heavy showers all morning. 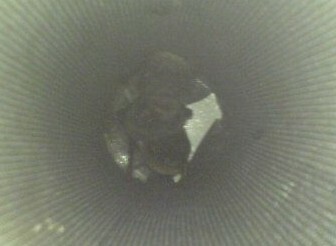 10 September 2011 - 10 microbats (all female) found in one tube. 5 September 2011 - Mowed beside the main shared path and beside the track in the woodland. Sprayed in the woodland and in the recently planted north-east 2013 area. Cut and pasted a number of small hawthorns. Slashed beside the path in the recently planted north-east 2013 area. 4.5 hours work. 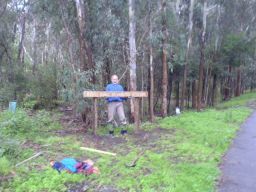 25 August 2011 - RMIT students rolled and removed Trad from the area north of the path near the bridge. I slashed picnic areas, and some of the 2008 area. approx 20 x 2.5 hours and ¾ hours work. 24 August 2011 - slashed the north-west of the 2013 area. Cut and poisoned some pittosporum and hawthorn in this area. approx 3 hours work. 22 August 2011 - slashed the north-west of the 2013 area. Gave presentation to Melbourne Water Environmental Flows Committee. approx 3 hours work. 17 August 2011 - slashed around the carpark entrance area. approx 1 hours work. 15 August 2011 - slashed the north-east area of the woodland. approx 3.5 hours work. 12 August 2011 - Community work day. 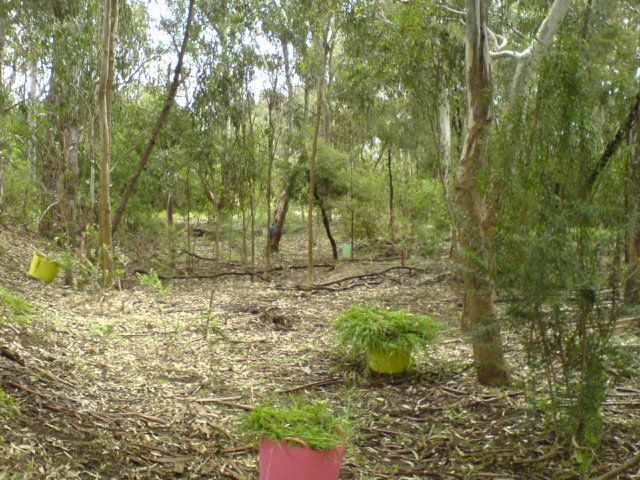 Planted approx 320 bidgee-widge ()Acaena novae-zelandiae between shared path and billabong. Weeded western end of 2008 planting area. Removed one pittosporum from RMIT 2011 work area. approx 3 hours work * 6 people. 1 August 2011 - Planted 15 native raspberry (Rubus parvifolius) in the 2008 area which was weeded yesterday. Mowed the north-east area of the woodland. approx 3 hours work. 31 July 2011 - Community work day. Weeded western end of 2008 planting area. Uncovered a good amount of regen, - small snowy daisy bushes and some wattles. Public meeting elected 5 committee members. Slashed bank west of picnic areas. approx 3 hours work * 4 people. 29 July 2011 - Mowed the shared path verges and the track edges in the woodland. Slashed more of 2009 planting area. approx 3 hours work. 27 July 2011 - Slashed blackberry in the woodland (around the small lake) and along the golf course fence. approx 3 hours work. 22 July 2011 - Slashed more of 2009 planting area, and sprayed some of the trad. Slashed and sprayed the trad on the billabong peninsula and pulled out some madeira winter cherry and blackberry. approx 3 hours work. 21 July 2011 - Slashed the boxthorn slope and around the eastern picnic area. Cut a path towards the woodland area beside the Chris Cross slope. approx 1 hours work. 18 July 2011 - Slashed more of 2009 planting area. approx 3 hours work. 18 July 2011 - David and I built one end of picnic table, but met a 6" thick piece of concrete 2' x 3' where the second post was to go. Took much longer than expected. Slashed picnic areas. approx 7 hours work * 2. 8 July 2011 - Community work day. Weeded western end of 2008 planting area. Uncovered a good amount of regen, - small snowy daisy bushes and some wattles. approx 4 hours work * 5 people . 1 July 2011 - Mulched poa area next to picnic area path, which I weeded yesterday. Sprayed some of the 2011 area - between the golf course fence and the shared path, and about 10 metres east of path in woodland, and western and part of southern bank of billabong. 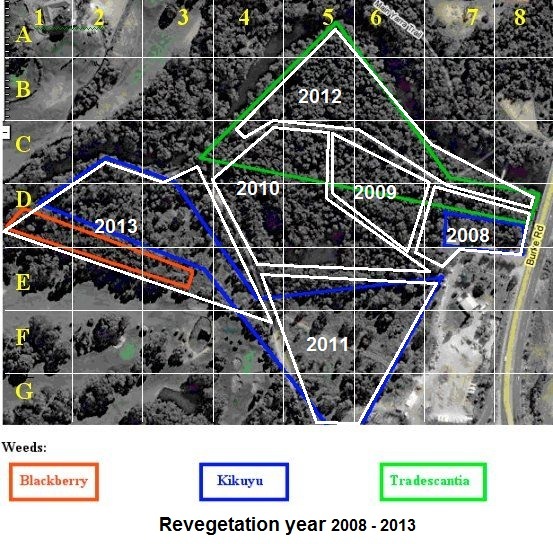 Slashed some blackberry in 2013 area. approx 5 hours work. 29 June 2011 - Slashed more of the 2009 area. Trail=cam on overflow billabong had no useful photos. approx 4 hours work. 26 June 2011 - Community work day. David painted the BRB signs. Weeded and spread 2 ute loads of mulch over bank below the picnic area. 4 people * approx 3 hours work. 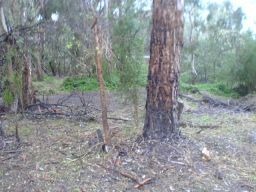 20 June 2011 - Slashed south bank of the billabong - lots of kapok vine and Madeira winter cherry plus a fair bit of Trad. approx 4 hours work. 15 June 2011 - Slashed more of the 2010 area, between dirt track and billabong. approx 3 hours work. 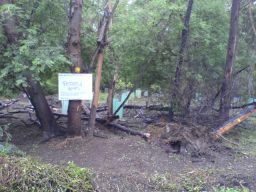 10 June 2011 - Community work day. 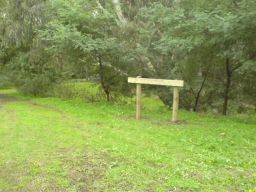 Erected the last BRB sign at the south end of the Reserve and weeded the bank below the picnic area. Pulled up a Poa tussock and planted the separated parts (about 70) on the bank. Michael and I then pulled some broom from the MW pumping station bank. 5 people * approx 4 hours work. 3 June 2011 - Slashed more of the 2010 area. 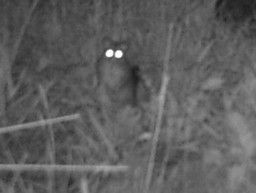 Trail cam I purchased was delivered so I have set it up in the north-west area. approx 3 hours work. 2 June 2011 - Slashed the eastern picnic area and around the upper areas. approx 1 hours work. 1 June 2011 - Mowed and slashed the southern section of the woodland. 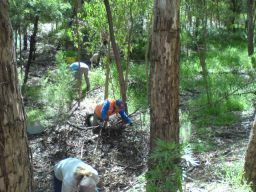 RMIT CaLM Students conducted a fauna survey and found macropod footprints. approx 3 hours work. 30 May 2011 - Mowed and slashed the south-western section of the woodland, and the shared path verges. approx 4 hours work. 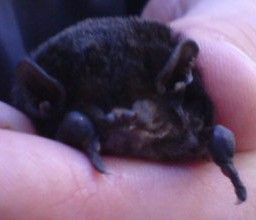 21 May 2011 - Bat tube check found 1 male and 1 female Gould's wattled bat in separate tubes. 20 May 2011 - Slashed more of the 2010 area (C4), between path and billabong. approx 4 hours work. 18 May 2011 - Slashed more of the 2010 area (1/3 of D4 and D5), between path and billabong, and sprayed area slashed on 16 May. David erected sign at Chris Cross car park entrance. approx 3 hours work. 16 May 2011 - Slashed part of the 2010 area (C4 and D5), between path and billabong, and brush-cut fennel and blackberry on path verge in the woodland, and picnic area. approx 4 hours work. 9 May 2011 - Slashed part of the 2010 area (½ of C4 and all C5), part of D5, shared path verge in the woodland, and picnic area. approx 3 hours work. 4 May 2011 - I slashed the north-east area of the woodland towards the small wetland. 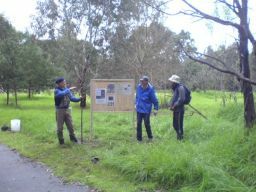 RMIT students worked on quadrats and structure diagrams for the area north of the path from the Burke Rd. bridge to 40m west of the Burke Rd. track. approx 1 hours work. 29 April 2011 - A ckeck of the bat tubes showed 2 tubes in use with a several in one. The bat group from Wilson Reserve collected and 'assessed' the bats. There were 3 females and 1 male in each tube. 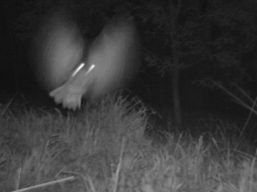 They were released at BRB after dark. 28 April 2011 - David and I slashed the north-east area of the woodland. 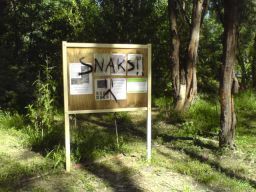 70cm tiger snake seen near Burke Rd. track / bike path junction.approx 4 hours work. 27 April 2011 - Pulled out most of the old star picket fence. Moved the fallen tree back from the edge of the path with the assistance of 2 joggers. Slashed more of the 2009 area and sprayed 35 Litres of glyphosate on slashed Trad at 2% concentration, with a dash of washing up liquid added as surfactant. approx 7 hours work. 23 April 2011 - Slashed more of the 2009 area. approx 3.5 hours work. 21 April 2011 - Slashed around the car park level area. approx 1.5 hours work. 20 April 2011 - Slashed some of the 2008 area west of the picnic area. 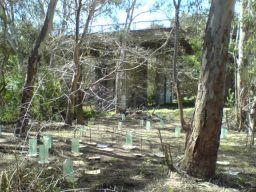 RMIT students came to do a 'Habitat Hectares' assessment of the area north of the bike path and 150m west of the bridge to the brige. approx 1.5 hours work. 18 April 2011 - Slashed more of the 2009 area. approx 5 hours work. 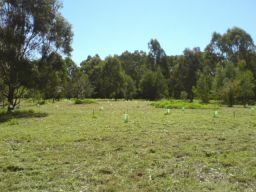 15 April 2011 - Slashed half of 2009 area (with new Hitachi brushcutter), mowed picnic areas and planted 20 Kangaroo apples on boxthorn slope. Found a self sown sprawling bluebell (Wahlenbergia gracilis) approx 5 hours work. 7 April 2011 - Slashed around carpark level and picnic area until brushcutter clutch broke down. Photographers came to take pics for RMIT supplement in Fin Review. Saw snake on boxthorn slope. approx 1 hours work. 2 April 2011 - Bat check showed the bat had returned to the usual tube, with friends. 1 April 2011 - David slashed in the woodland. - approx 2 hours work. Temp 17°C, pH 7.4, Turbidity 80, Nitrates 1mg NO 2 , 10 µg NO, EC 250 µS/cm. 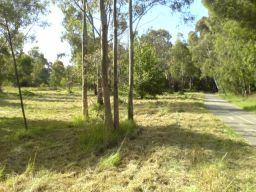 31 March 2011 - Mowed the picnic areas, some of the car park level, and the bike path verge. - approx 1½ hours work. 18 March 2011 - David and I sprayed the woodland area, with David working more on the blackberry. Also removed the old Burke Rd. access track sign. - approx 8 hours work. 25 February 2011 - Slashed the boxthorn area, the edges of the top area and picnic areas, and mowed the bike path edges. - approx 4 hours work (bike path edges to 1 m = 45mins). 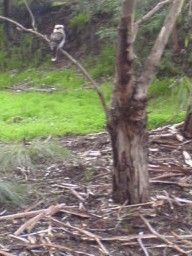 Checked bat tunes on 26/2 - no bat, but mother and baby ringtail possum in nestbox. 24 February 2011 - Mowed the edges of the top area and east picnic area. - approx 1 hours work. 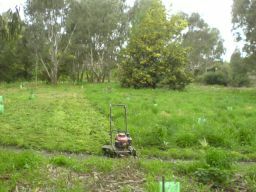 21 February 2011 - Mowed the about a ¼ of the area south of the billabong. Saw 2 blue tongue lizards. - approx 4 hours work. 14 February 2011 - Purchased a new 530mm (21") utility mower. Mowed the picnic area and the area to the east, 2-3 cuts of the bike path edge from bridge to MW pumping station, and a small area south of the billabong, including a cut either side of the 2 main tracks in the woodland south of the billabong. - approx 2 hours work. 11 February 2011 - Community work day but raining. Some weeding done, tree guards replaced after the flood (again!) last weekend. 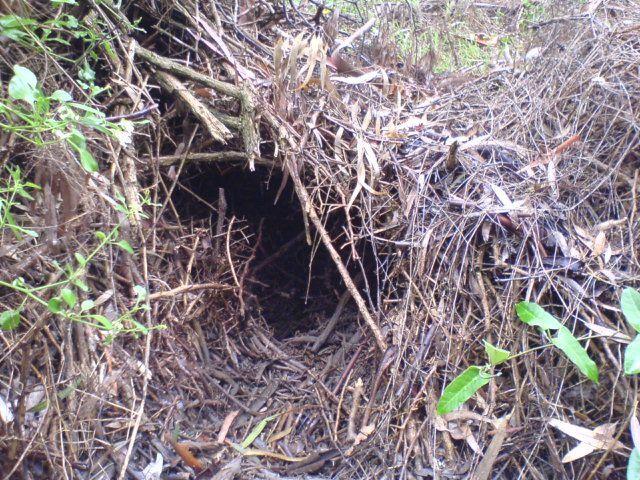 Found what appears to be a wombat refuge in a pile of old boxthorn. - approx 9 hours work. 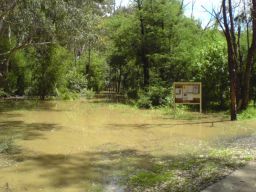 5/6 February 2011 - About 90mm of rain raised the river height to 8.2m, which refilled the billabong again, and left a lot of debris and silt over most of the area. Many tree guards washed off their plants and up to 100 metres away..
2 February 2011 - Slashed more of 2008 and the 2009 area. - approx 4 hours work. 28 January 2011 - Slashed the east picnic area, the top near the road and the 2008 area. - approx 3 hours work. 21 January 2011 - Timur Tunovic and I attempted to remove a star picket fence in the woodland on the golf course side, but they didn't move! So we weeded and planted 70 Dichondra repens at the bike path/Burke Rd. track junction, and 70 ruby salt bush Einadia nutans along the picnic area bank. Manga tak Tim! I then weeded and planted another 10 'Poa labs' in the picnic area - approx 2 x 3 hours work. 19 January 2011 - Slashed the ex-boxthorn area, around the new Muttonwoods, and more of the 2009 planting area which is now a bit over half done. 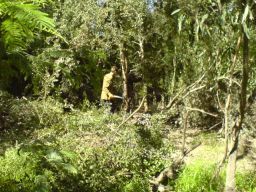 David mowed around the plantings in the woodland south of the billabong. 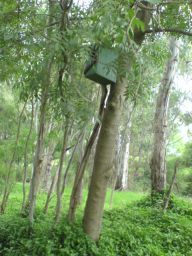 A nest box has appeared in a tree near the river - approx 2 x 5 hours work. 17 January 2011 - Slashed about close to half east end of 2009 planting area which was very weedy after recent rains and warm weather. - approx 6 hours work. 14 January 2011 - Slashed the picnic areas and a bit of the path and near the bike path / Burke Rd. track junction. - approx 2 hours work. 5 January 2011 - I slashed the woodland (golf course side of the bikepath) with a hired "Billygoat slasher" for fire hazard reduction. - approx 10 hours work.